I’m a big fan of Steamworld Dig. The gameplay was fun and easy to get to grips with, the universe was interesting (and made even more interesting by the next game in the series – Steamworld Heist) and it ran perfectly on the PS Vita. 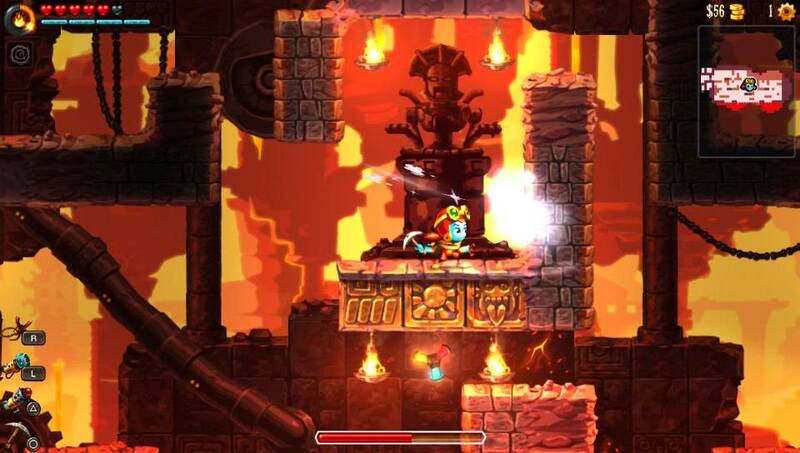 Ive been so impressed how Steamworld Dig 2 improves on the first game in every aspect. 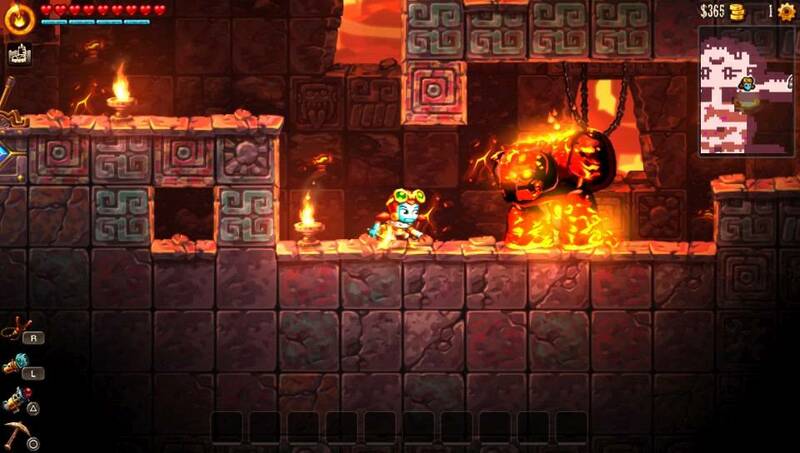 In a year with Ys VIII, Undertale and Salt & Sanctuary being released for PS Vita, it was hard to imagine the year getting better, but along comes Steamworld Dig 2 to prove me wrong. 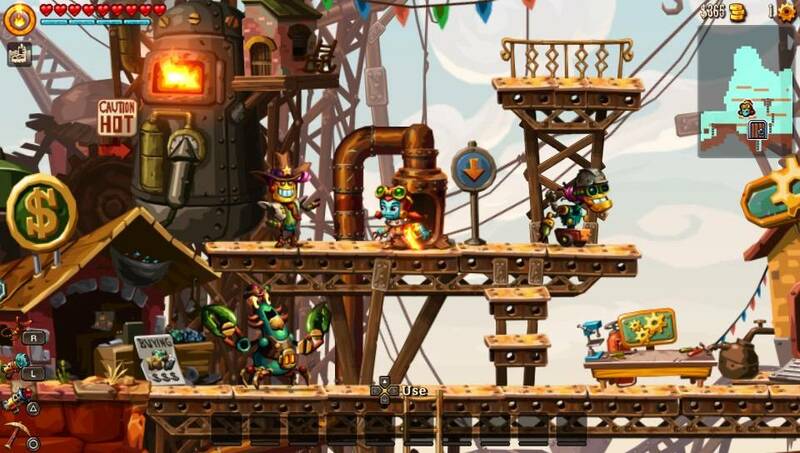 The story for Steamworld Dig 2 picks up soon after Steamworld Dig 1. The protagonist from the first game, Rusty, is missing and its up to you, Dorothy, to find him. Dorothy’s journey takes her through a variety of caves, digging downwards to find her missing friend. Along the way, she meets a variety of towns people all concerned with the recent earthquakes that have been plaguing their home. I found the story for Steamworld Dig 2 really interesting. It gives a purpose to your adventure but doesn’t get in the way of it with overly long dialog and exposition. The story added to the mythology created in the previous games, and I recommend playing them first so you can better understand some of the conversations Dorothy has with the towns people. 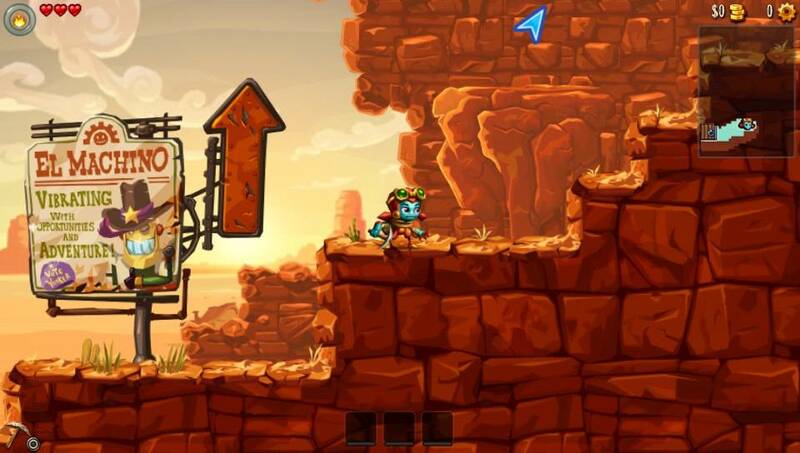 Steamworld Dig 2 is a 2D, metroidvania game, although you’re travelling downwards for the most part. You use your pickaxe to break rocks and make a pathway down to your objective. Along the way, you pick up a variety of the new abilities and you can buy upgrades using the gems you find while digging through the caves. You also find hidden, optional caves with challenges to beat and secret items to find. Some of the optional caves I found really difficult. They vary between challenging you in terms of having puzzles to figure out or precise platforming. There are so many secret items to find. When you find all the secrets in a cave, the map has a green tick to show its completed. I probably would have completed the game much faster if I hadn’t been so obsessed about trying to beat every cave, find every treasure and get those green ticks! The controls are where the game shines. Controlling Dorothy is so straight forward and using all the abilities she acquires feels so natural. Running, jumping, flying and grappling feel so good. 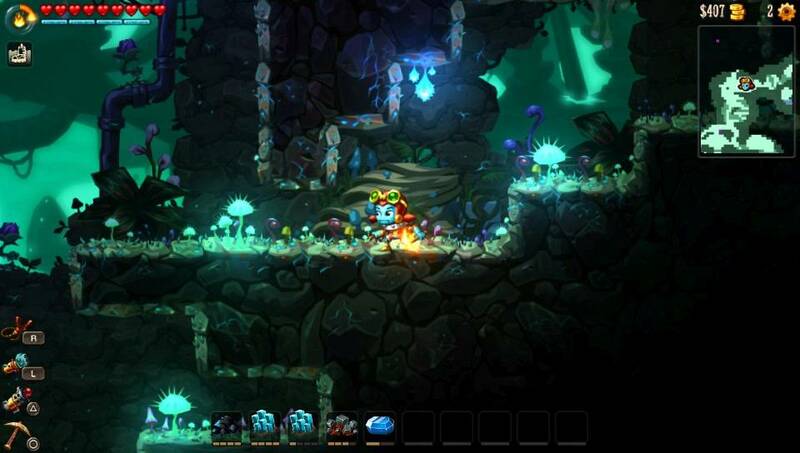 There are some 2D platformers where the jumping and running just feel right, and Steamworld Dig 2 is one of those games. All the abilities she acquires are useful. In the first game, I ended up getting trapped a couple of times, because I created a hole too deep and couldn’t get back out again. That is far less likely in Steamworld Dig 2, because of the grappling hook and rocket pack abilities. The checkpoints are also the right level of frequency, allowing you to return to the town and heal just often enough that you don’t feel too out of your depth. The difficulty does ramp up later in the game. I don’t think I died once for the first 4 hours, but then it started happening more and more. It was partly my fault for wanting to keep digging deeper into the caves despite my lack of health or light to see, but also I was upgrading my other equipment more than my health so ended up being quite weak in terms of hit points. There is a lot of customisation options so this doesn’t necessarily need to happen to you. When you upgrade a piece of equipment, you unlock an extra ability that you can unlock by assigning cogs to. Cogs are hidden all over the map or can be bought. The extra abilities are very useful and you can reassign cogs whenever you want so you can change up your abilities with ease depending on whether you’re exploring a cave of lava or your about to take on a difficult boss. Its worth pointing out that although this game is also on the PS4, Switch and PC, the PS Vita version runs perfectly. I didn’t have any instances of slow down or bugs. The load times are practically non-existent on the Switch and PS4. On the Vita, load times take around 2 seconds when moving between locations. Other than that, the PS Vita version plays exactly like the other versions. The cartoony graphics look so good. The art style of the characters, especially the robot towns people are varied and colourful. You meet other characters along the way, who again have the perfect look for their character and personality. Compared to the other releases of the game, the PS Vita version looks perfect with no blurriness or noticeable downgrade when playing. The computery sound effect when the robots talk, suit the game and the characters and I liked the music. Its not a game, I’d go out and buy the soundtrack for, but it suited the themes of the levels. 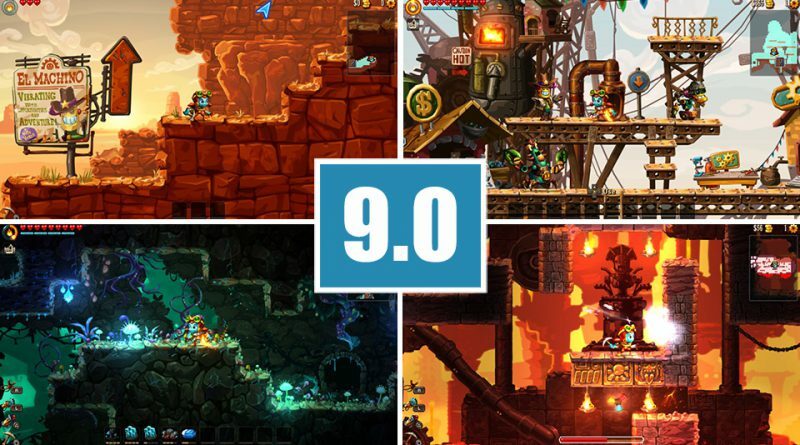 Steamworld Dig 2 is an excellent game. The fun and fluid gameplay is the best aspect of the game, but the story, art style and music complement each other perfectly to create one of the best games on the PS Vita. It’s a game so enjoyable, that you wont want it to end (and with all the secrets and collectibles your play time can be considerably extended). If you’re new to the series, you should pick up and play the earlier games first, not just for the story but because they are also so good. This is definitely the best game in the Steamworld series. Bring on Steamworld Heist 2!